The app title is one of the most basic factors that can be improved in ASO (App Store Optimization or Mobile SEO). Indeed, it has a huge weight in the App Store algorithm. Naming your app is therefore very challenging and must be the result of a complete study. This blog post will give you our 5 tips to create or improve your app title. Your app title is also your app’s denomination. When people will talk about your app, they will obviously use its name. You therefore have to choose a good name as it will stick to your app. The name of your app plays several roles. Along with the icon, the app title creates the 1st impression. It generally helps users to understand what your app is. Of course, on a second level, your description and screenshots will give more details on what your app clearly does. App’s titles are also extremely important in terms of ranking. Just like in SEO, titles have more weight in the algorithm. The words used in the title must therefore be optimized to get the best chances to improve your ranking in the App Store. 1. What is that app? Your app title needs to tell users what they will find by downloading your app. Reading your app title should give at least an idea of what you app offers. Screenshots and description will go into details. But your app name needs to be relevant and in accordance with your content. There’s a recurrent hesitation between using a brand name or a generic name. Well, it depends on how popular and known you already are. If you have a strong branding awareness (a name that everyone already knows) why not use it for your app title. For example “Abercrombie & Fitch”, “Amazon” or “Facebook” apps are using their brand name, as they are already extremely famous. People will know what to expect by seeing their title and will naturally type their names in the Search box if they want to download these apps. However, if your brand is weak and/or if you’re new on the market, we would advise you to use a generic name instead of your brand name. For example, the app “Moves” uses its brand name but people won’t be able to directly understand what the app does as it is not famous and not descriptive enough. 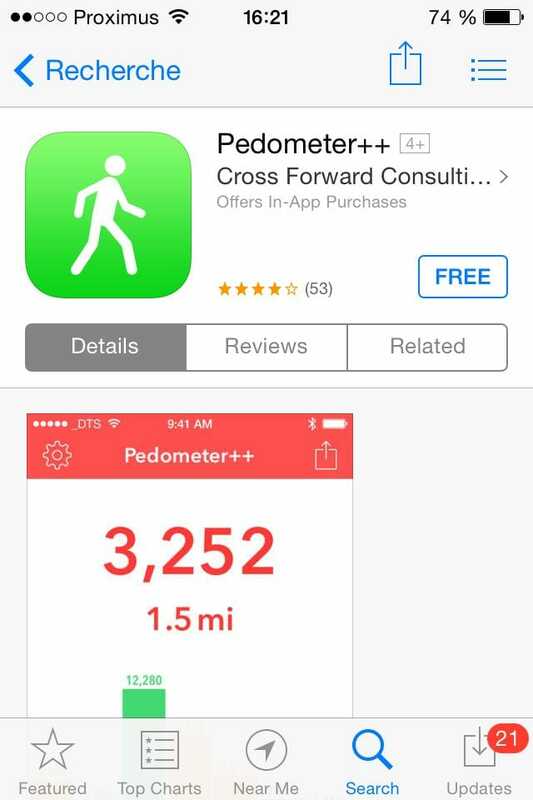 If we look at one of its competitors “Pedometer++”, users instantly figure out what the app is about thanks to this generic name that everyone understands. The second app has therefore better chances to be downloaded as its title goes straight to the point. Outlining your plus-value is one of the best way you can title your app. Show users what you do and why you’re better than the others. Keywords have a very important role in an app’s ranking. If well chosen, they can improve the position of an app in the App Store drastically. iOS developers can enter a list of keywords corresponding to their app. This list is limited to 100 characters, which is quite low. It is actually interesting to include the most relevant keyword in the app title. Why? Firstly because words in the title have a stronger impact in the algorithm than words in the keywords field. Secondly because keywords that are present in the title don’t need to be repeated in the keywords field. This means that you are actually winning some characters in the keywords field. You will therefore be able to respond to more keywords and thus have more chances to improve your App Store visibility and ranking position. 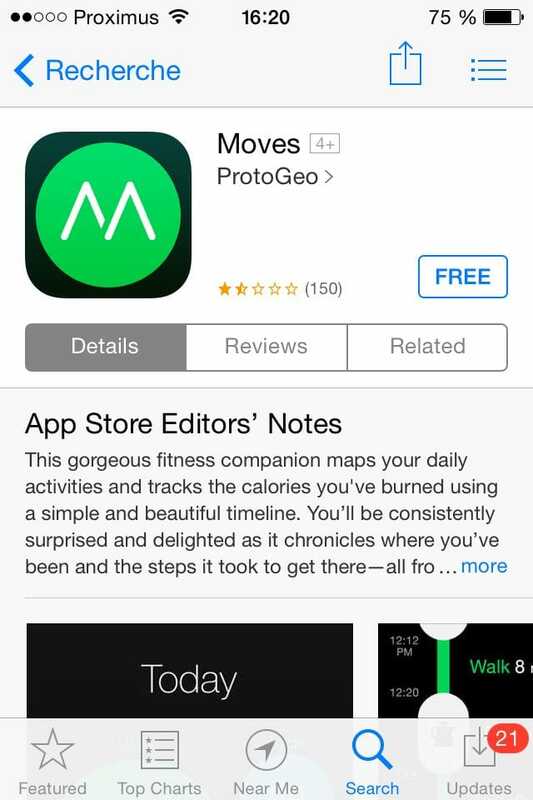 If we apply this to our previous example with the app “Moves”, we could therefore recommend the app to change its name to something like: “Moves – Track your daily exercise and calories”. In that case, the branding name can stay in the title as it is now coupled with a small descriptive sentence. Keywords _“track, daily, exercise, calories” _are extremely important in this case, as they’re the best to outline what the app does. The fact that they’re present in the title will give more weight to the app and leaves space for other keywords in the keywords field. It is therefore extremely important to find the best keywords for you app. The best ones being the ones with low competition but at the same time with high traffic and popularity. It will require a lot of work, as you will need to research, track and test these keywords to evaluate their success. Keywords are very challenging but once optimized, they can make your app shine brighter. An app title in the App Store can be up to 255 characters long. However, when an app appears in the Search results on the iPhone, only around 30 characters are displayed. This means that you absolutely need to put the most relevant and important keywords at the beginning of your app title. For example, the app “**Toilet Time – Mini Games to play in the bathroom” **uses quite many characters in its title. It is important to find a balance between the number of available characters for your app name. Don’t be too short, but don’t be too long either. We recommend using app title of 80 – 100 characters. Just like we’ve seen on our previous blog post for screenshots localization, it is important to localize your app name as well. Actually, it is preferable to completely localize the whole app if you’re planning on expanding to various countries with different spoken languages. You therefore need to come up with different names for your app. If we take the “Toilet Time” app for example, we see that for each country, its name and description are optimized in function of the country’s official language. Only remains the brand name “Toilet Time” in English. This is absolutely necessary if you want to get the best chances of being found in different App Stores. Plus it is easier to convince people in their mother tongue rather than in a foreign language. You want them to understand everything and avoid frustration to increase conversions. Choosing an app name looking alike other dozens is not the right way to go. It may be tempting to use words that are already deeply rooted in the minds as they’re used in very popular apps, like “Birds” (Angry Birds), “Zombie” (Zombie Tsunami, Plants vs Zombies) or “Flappy” (the famous Flappy Bird). However, Apple took several measures to avoid this phenomenon. Few months ago, Apple and Google began to reject games with the word “Flappy” in the title. It is therefore important to stay authentic and not steal others ideas. You may also want to avoid using words that are too generic. For example, using the word “Game” won’t really help you stand out from other apps, as they are already thousands of titles using it. The point is to be found: you therefore need to offer something different and not too close to the existing majority.